Magnis Resources Limited (Magnis) (ASX: MNS) announced that AL Capital Holding has invested USD 11.1 million in Magnis for a 4.98% equity holding in the company. In its press release, Magnis indicates that the funds raised are being used to strengthen the balance sheet to allow Magnis to capitalize on current and future growth opportunities in the battery technology sector; and, to fund the ongoing investment in the future development of the Company’s 100% owned Nachu Graphite project. The Nachu graphite project in southeast Tanzania is one of the largest mineral resources of large flake graphite in the world, with an estimated production life of roughly 40 years. The unique crystal structure and low impurities in the Nachu graphite mineralization allow production of a premium product concentrate purity levels up to 99.6% graphitic carbon content (TGC). This is firmly targeted at the rapidly growing lithium-ion battery sector. 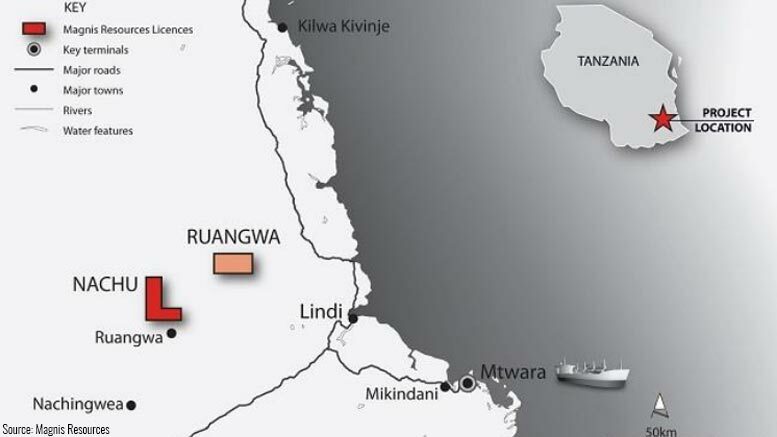 Graphite discoveries in Tanzania come mainly from Australia based graphite developers, Magnis, Volt Resources (ASX:VRC) and Kibaran Resources (ASX:KNL).